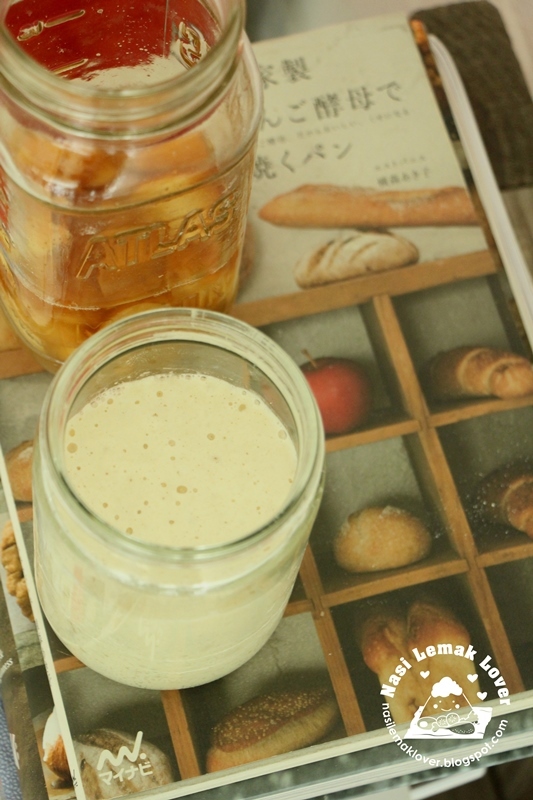 This time i prepared my own way of Apple yeast water then using this yeast water made into natural yeast or sourdough starter. Also i feel the success rate of making natural yeast using yeast water is higher than just made with flour and water , like my sourdough starter. 1. Wash the apple, remove the core, retain the apple skin, then slice and cut into cube size. 2. Day 1. Put all ingredients and cover with the lid, shake the container and let them mix well, put in a shady place ( I place inside kitchen cabinet). 3. Day 2- Day 6. Shake and open the container at least 2times a day. This is to prevent apple getting moldy and let the gas released. You can see bubbles formed and also able to hear sizzling sound. 4. On the day 7, apple yeast water is ready to make into natural yeast. This recipe also featured in a Chinese New Paper Sin Chew daily on 21/10/2017. I was happy to share this recipe, so more people able to bake healthy bread for their family. Thank you for the wonderful sharing. I am very interested in this natural yeast stater, may I know how to we keep the apple water? Ans how to we maintain the sourdough starter? I love your recipes and your blog have help me produce wonderful result. Would appreciate an reply and thank you in advance. I am Ng by the way. Congratulations on being featured on the newspaper. I started this apple yeast water immediately after reading your post. I hope this time I'll have better luck. I wasn't successful on my quest with the natural yeast starter using flour and water. Please also share recipes on how to bake a sourdough loaf. Thanks in anticipation. Wish to try to make my own bread one day. Sonia your recipe never fails us. Good job! Thank you for sharing the translated version of the recipe! When I saw it was featured in a Chinese newspaper in Malaysia (from your Instagram), I was tempted to contact my family abroad to secure me a copy! Ng, sorry, i have missed your question . 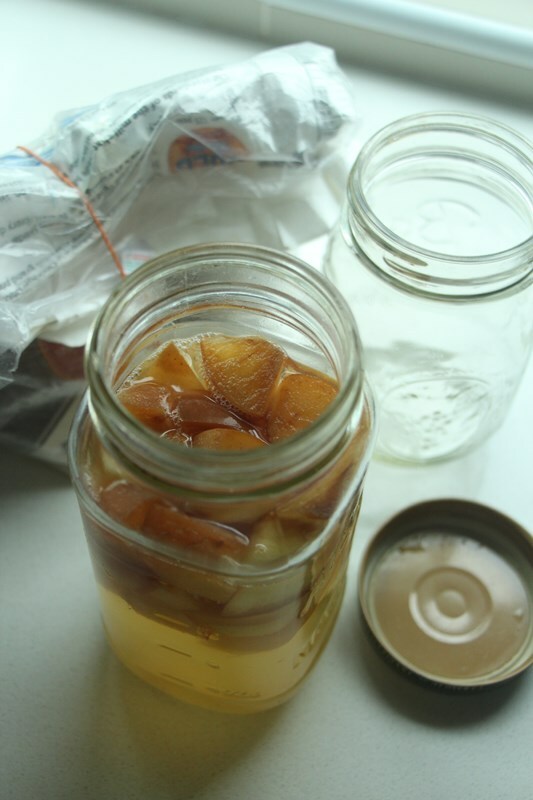 Did you meant how to keep ready apple yeast water? just keep in room temp when you have started to use them to make natural starter. 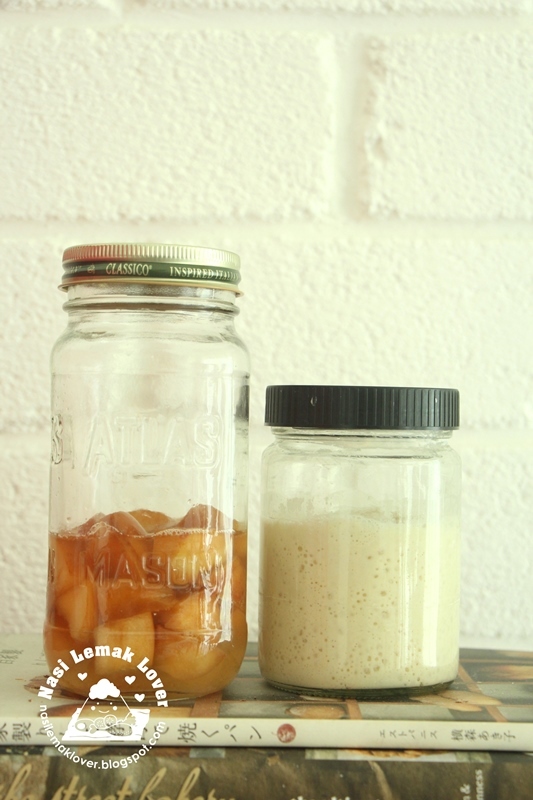 After few feeds, you will almost use up the apple yeast water. If got balance then store in the fridge, you can add 1-2tbsp when you making bread . For feeding natural starter, you can feed once a week and keep them in the fridge. If i have time next time, i will try to write a post on how to maintain the natural starter as there are many ways to maintain it. Do drop me email if you have further question. thank you for replying. Will try doing your way and hopefully I can get a good result. 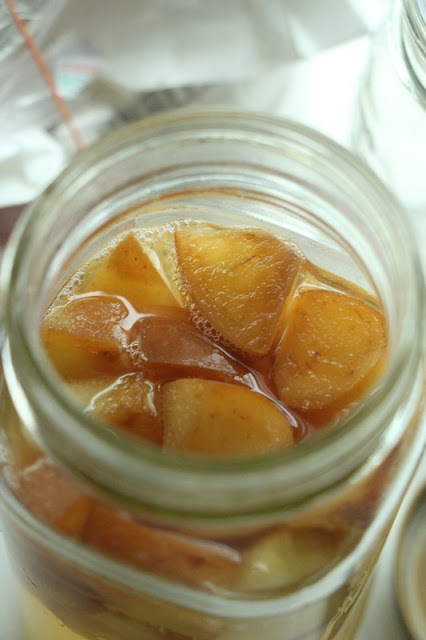 In reference to your answer to Ng, do we discard the chopped apple pieces while maintaining the apple yeast water at room temperature? Hi Sonia, just want to know after u use the filtered water to feed the starter, it take how many days to get the starter able to rise double within 4-5 hour. Koh it depend how strong is the starter . If I could remember mine only take 1 day . Can we still make natural yeast without filter water? for baking asian buns but never succeed in making rustic bread. it is means that it's need to proof longer? Appreciate your sharing & loves your recipe. Good afternoon, I wonder what the multi-faceted flour would be, and mixed with what flour? In the translation I made, it tells me when the yeast is rotting, I do not understand, I could clarify these two doubts, because I would like to use this yeast. thanks. I like apples evry much. I need to get new recepie and be pleased with it. I have the things likke that and I am pleased.future simple tense with rules and examples Great to have it. Thank you for sharing. I have been using starter dough (made from yeast, sugar, flour and water and leave it overnight) to make pau lately. I wonder is this the same as sourdough starter. I wanted to use the starter dough to make more different things. I only know how to use it to make pau and I keep feeding the starter dough until I have to discard some if I don’t use it frequently. I would like to seek your advise.... Is there any different recipe that I can search on how to make use of the starter dough into making different type of baking. For example an I use this to make Chinese cullers.... and how much starter dough to use.... how to measure how much starter dough to use. I have search online for some ideas but mostly is for making pau (which is most popular search). I look forward to her from you. Thank you. I used to eat apple yeast daily, as prescribed by the doctor. Michelle, yes you need longer proofing time if you use sourdough starter . Unless your starter is young and active(no sour) then you can add more starter to speed up the proofing time . CT, yes your starter is so called sweet starter . 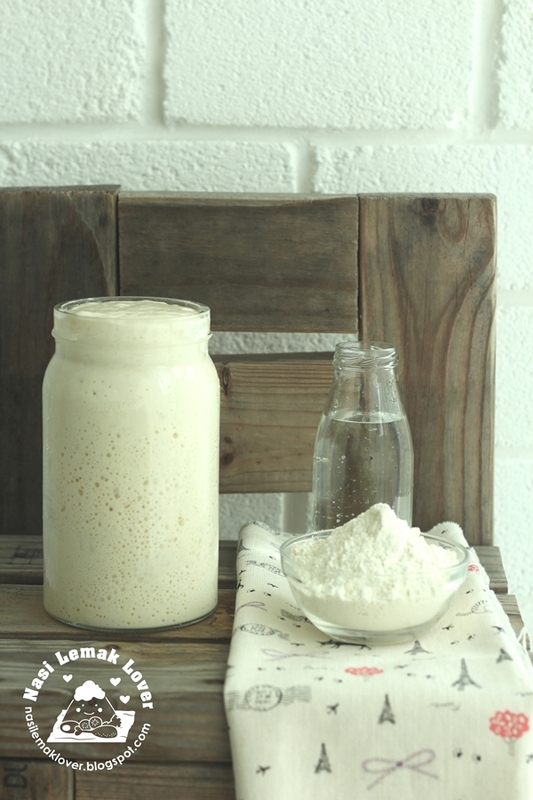 Ya there are not many recipes using sourdough starter. You can just experiment yourself , just use certain % of starter to replace flour and water from the original recipe . As for the %, it depend your starter is young and active or not (no sour) then you can use more %. Silik , no is not one time discard , do it few times until you get active starter . Yes when feeding , just add flour abc water .yes you can cover with cheese cloth.